Reconstruct the I-71/75 interchange at KY 536 (Mount Zion Road) to a diverging diamond interchange as recommended in the Kentucky Transportation Cabinet’s Interchange Modification Study to improve safety and congestion (Item Number 06-14.00). Widen KY 536 from Tiburon Drive to US 25 (Dixie Highway). Provide a multi-use path along KY 536 to connect to the multi-use path that is being constructed adjacent to the western project limits. The project will connect to the improved portion of KY 536. The two projects combined will provide an improved connection from I-71/75 to the planned Union Towne Center. The design and right-of-way phases of this project have been funded. This recommendation will continue the investment in this project to fund the utility and construction phases to implement the improvement. 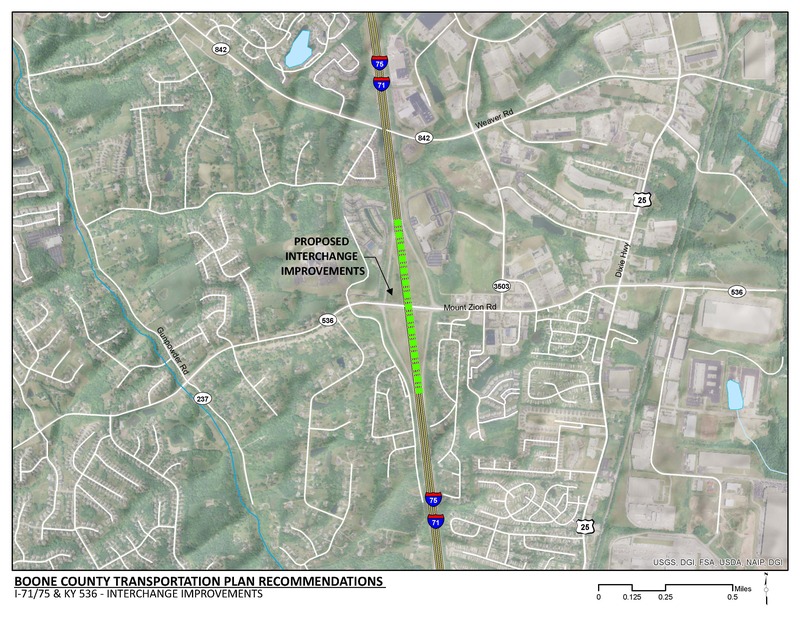 Pedestrian accommodations through the project limits will provide a multi-modal connection between KY 536 (Mount Zion Road) and US 25 (Dixie Highway). The multi-use path proposed as part of this project is consistent with Boone County’s overall goal of improving safety and connectivity for bicycles and pedestrians. Click HERE for a map of multi-use paths in Boone County. There is a cluster of closely spaced access points between I-71/75 and US 25 (Dixie Highway). The KY 536 interchange primarily serves residential development to the west of I-71/75 and a mix of industrial, residential and commercial development to the east of the interstate. By 2040 population along KY 536, to the west of I-71/75, is expected to grow by over 8,000 households. The crash rate along KY 536 within the project limits is approximately 90 percent higher than the statewide average for similar roadways through the section of KY 536 that corresponds to the section with closely spaced intersections. There are no existing, dedicated bicycle or pedestrian facilities along KY 536 in the project area. Planned multi-use paths are included in the KY 536 widening project adjacent to this recommendation. This interchange is a critical component of TANK fixed route 22x.